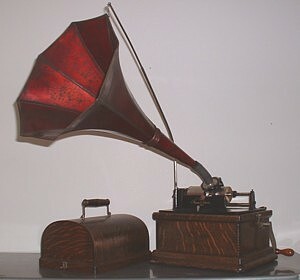 The Fireside was introduced to play both 2 and 4 minute cylinders and was priced at $22 with a maroon Fireside horn. A black cygnet horn or oak horn was available with the machine for an extra charge. The model B Fireside was introduced in 1912 and was geared to play 4 minute cylinders only.